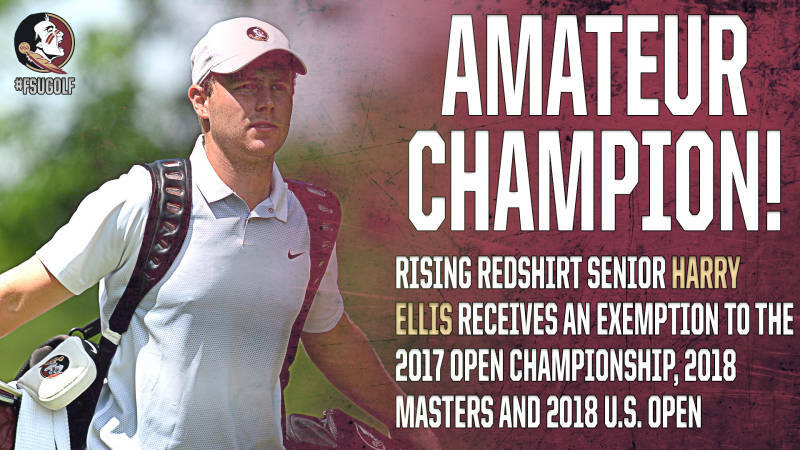 TALLAHASSEE, Fla. (Seminoles.com) – Rising redshirt senior golfer Harry Ellisdelivered an epic comeback on Saturday to defeat Australian Dylan Perry in sudden death and win The Amateur Championship held at Royal St. George’s Golf Club in England. With the win, Ellis earns exemptions to the upcoming Open Championship held July 20-23 at Royal Birkdale, the 2018 Masters and the 2018 U.S. Open. Ellis and Perry battled back-and-forth in Saturday’s championship which included a 36-hole match play format. However, with just five holes remaining Ellis found himself four down to Perry. But Ellis mounted his comeback by playing steady over the last five holes, recording par on each. Perry started to break down over the remaining stretch, bogeying four of his final five holes. With Ellis three down with three holes left, Perry bogeyed each remaining hole. The two then went to sudden death, and after halving the 37th hole, Ellis carded a par on the par-4, 415-yard hole that was the 38th played. Perry recorded a double bogey to give Ellis the title. Ellis emerged as the English Amateur champion in 2012 at just 16 years old, surpassing Sir Nick Faldo as the youngest winner of the championship. The Southampton, England, native decided to come to Florida State a few years later and recently completed his best season at FSU, being named a PING Honorable Mention All-American. Ellis also recently competed in the Arnold Palmer Cup for Team Europe, and will participate in the Walker Cup at Los Angeles Country Club held Sept. 9-10. Ellis becomes the third player to win both the English Amateur and The Amateur, joining Sir Michael Bonallack and Michael Lunt. Of the three, Ellis achieved the dual feat at the youngest age. Ellis recorded an average score of 71.62 this past year for Florida State. He posted three Top 5 finishes this year, highlighted by a second-place finish at the Seminole Intercollegiate. In the NCAA Championship at Rich Harvest Farms, Ellis recorded a 6-under 66 in the second round, the lowest round vs. par by a Seminole in an NCAA Championship. The Golf Coaches Association of America announced that redshirt senior Cristobal Del Solar (PING Third Team All-American) and Harry Ellis (Honorable Mention) were named as PING All-Americans. For Del Solar, it is his second All-America honor of the year after also being named a third-team All-American by Golfweek.